A "pristine" dinosaur tooth found on the Isle of Wight has shed new light on a predator related to Tyrannosaurus rex. 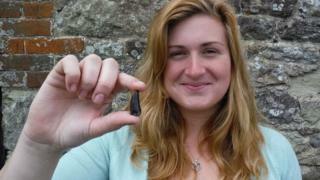 Student Megan Jacobs found the fossilised front tooth of a Eotyrannus lengii while walking on Compton Beach. It suggests the Eotyrannus could have been six metres (20 ft) long - larger than previously estimated. Oliver Mattison of the Dinosaur Expeditions Centre said the find was "tantalising". He said it raised the prospect that a complete skeleton could be found somewhere along the Isle of Wight coastline. Roamed land where the Isle of Wight is now located during the Cretaceous period. Palaeontology student Ms Jacobs spotted the 2.8cm-long tooth in a fresh cliff-side rockfall on the island's western shore. "I could tell it was a big carnivore tooth, it was in pristine condition," she said. She took the tooth to the Dinosaur Expeditions Centre, where Mr Mattison said it was from the front of the creature's mouth and its distinctive serrated pattern marked it out as a Tyrannosaur. The island is believed to be the only place where remains of the species have been unearthed. It was previously estimated to have been about four metres (13 ft) in length. Mr Mattison said: "It is significantly bigger than previous finds and shows it was Eotyrannus was definitely bigger than estimates and may be even bigger still." The tooth will now be placed on display at the volunteer-run Dinosaur Expeditions Centre museum.